My friend Kat sent this my way and it’s pretty staggeringly awesome that they’ve done this all in stop motion. The music is real nice, too. “Dream Music” is a project consisting of two stop motion music video performed by two masters of the genre:Marc Donahue and Sean Michael Williams. Each clip is impressive, mixing with stop motion the technique of lyric-lapsing, which is to synchronize the lips on words, which is incredibly difficult, especially when each music video represents more than 15,000 pictures, and every few seconds sequences requires between 6h and 8h of work… Awesome. Kristin Chenoweth | Popular (Live in LA). This week’s Chuck is all about flashing back on Sarah’s past, when she was still a nerdy girl named Jenny, and forward to her current life, which is interrupted when her past catches up with it. It’s an hour filled up by a soundtrack that makes the 90’s kid in me both want to get up and dance (To Chumbawamba’s “Tubmthumper”) and cringe (to The Backstreet Boys), but also an hour for nerds across America to believe they too can share cheeseburgers with impossibly gorgeous women with pasts more normal than they’d like anyone to know. In “Chuck Versus the Cougars” we get the season’s biggest twist yet: Nicole Richie can act. While it’s not a performance worthy of any awards, she plays the part of the stuck-up, popular cheerleader well, maybe only because it’s not much of a stretch personality wise. Heather (Richie) and her nerd husband (Ben Savage) run across their former high school classmate, Jenny, and secrets Sarah does not want coming to the surface start tunelling back into the light. Chuck’s loving the information overload, but Sarah’s visibly frustrated and kicking the crap out of a punching bag to try and channel her anger (lest anyone made of flesh and blood get hurt instead). Sarah’s past turns out to be shockingly average (Nerdy girl gets picked on, dad gets arrested to protect him from shady characters he was doing business with, and she gets pulled into the CIA), but it makes her seem more real and, for Chuck, not so cosmically distant from a nerd like him. Heather has married a man much like Chuck–a guy who’s a little geeky, considers math a fun hobby, and likes ties–and Chuck and her hubby get a chance to have a little nerd pow-wow at Sarah’s high school reunion. But to him, Chuck “Mad Dog” Bartowski is the epitome of cool, while Chuck on the other hand sees himself as just as much a nerd and just as incredibly lucky to have a woman like Sarah at his side. Except the problem is neither Sarah or Heather are truly with these guys. Heather turns out to be the one blackmailing her husband into turning over his top-secret fighter jet plans (though if he ever finds this out, the episode doesn’t show it) and only got with him with dollar-signs in her eyes, and Sarah has genuine feelings for Chuck, but last week already made clear the line that must be drawn between them. Due to a crazy series of unexpected events this past week, my reviews are way behind. In order to catch up I’m going to be writing a lot less. So here are just some of my mostly unorganized thoughts on this week’s episode of The Office, which I enjoyed less than last week. But while I wasn’t laughing as much, I think this episode did a good job of adding some depth to some of the series’ characters. Jan resurfacing in this episode is a reminder of just how bad she and Michael are together; a fact made more painfully obvious by the addition of Holly and the oozing amounts of chemistry they share. While the entire office realizes in a very matter of fact way that Jan’s baby is not Michael’s to begin with, it takes the potential daddy to be the longest to come to terms with these facts (well, right after Dwight, who plays in his own little world as usual). Michael gets to act a little immature here by feigning hatred toward Holly, but it’s only because his fear of Jan is back. If Friday Night Lights doesn’t get renewed for another season, it won’t have been for quality reasons. This season came crashing out of the gates with a revamped and rejuvenated show and continues to maintain its steady course in “How the Other Half Lives”. The Panther’s may have lost their fictional game, but the episode is a win with the exception of a few very minor weak spots. In football, tough calls have to be made on the fly, but the people of Dillon are all finding those hard choices playing out off the field in this episode. Coach Taylor is being made to choose between a boy he knows and one he doesn’t; a boy with crazy-mad drive and spirit and a boy with years of silver spoon-fed talent. Smash has to face his future and decide whether to go for his dreams by playing football at TMU or supporting his family by taking a promotion at the Alamo Freeze. And then Tim is finding his loyalty split between his brother and Lyla, and realizing having to choose between blood and love isn’t easy. What makes Eric’s decision work so well is the way that the writer’s have decided to portray JD and the McCoys. Mr. and Mrs McCoy are the villains of the season, with their fake smiles and deep pockets, but their son may not be an apple from their tree even if they’ve slapped a coat of glossy, red paint on him. When Matt and Julie find JD’s “shrine” in his home at the big Panther party (hosted at the McCoy’s home rather than the Taylors, after the planning proves too stressful for principal Taylor), JD finds them and makes a little joke at his own expense about showing them his gold plated diaper. The coach probably says it best when accosted by Buddy, Mr. McCoy and others: He knows who Matt is, both as a person and as a player, but he knows very little about the very young JD, and though it doesn’t mean the kid isn’t good or that he doesn’t have all kinds of potential, he’s going to stick with his guy, Matt. This whole setup could make room for JD as an upcoming character, possibly to replace seniors like Matt, who could become a very likable addition to the cast. He just doesn’t seem like another VooDoo, meant only to serve as an antagonist, and outside of his headache inducing parents could be a really good character with a lot of baggage to bring to the pile. The thing that sets Fringe apart from most mystery-of-the-week series is its stricter adherence to ongoing plots and a continued attention to building up a unique mythology for the show, centered mostly around the fictional mega-corporation, Massive Dynamic. 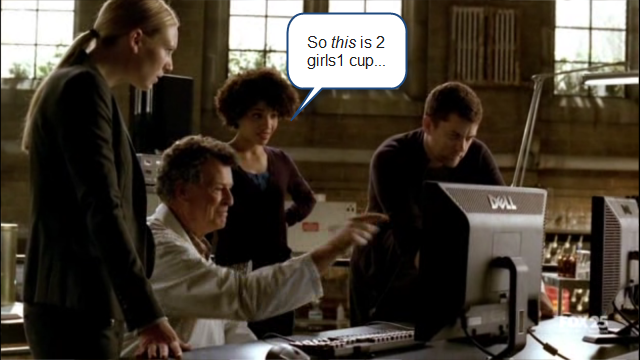 However, this could be a weakness as well, if Fringe veered too far from its cases and sunk in too deep with conspiracy theories and gasp-worthy twists. This episode attempts to ease any fears of this scenario by presenting a Massive Dynamic free hour, but ends up falling into the old predictability trap I thought it had strayed from. That said, the case is interesting and the characters are still growing more likable every week, so all-in-all it’s another solid episode for any fans of the show, but probably not good enough to woo many new ones. My biggest gripe at the moment, and one I felt had been assuaged by last week’s episode, is the too-formulaic setup of the standalone cases. The show is all about something called The Pattern–a string of mysterious and unexplainable phenomena happening all over the world–but there’s another very obvious pattern developing as well. This pattern goes as follows: An incident occurs, which Walter reveals could be based on old ideas he had studied, but that have been taken and perfected in the years since, and he then has a theory that Olivia pursues relentlessly until she reveals what she knows to her boss, who then reveals to her he’s known more than he let on all along and shares new, key information that advances the scenario into its final legs. Most episodes have contained some or all of these parts, and while it doesn’t make the value of the mysteries any less, it does take some of the fun out when you can see a blueprint of what’s to come without even trying. The case this week is one that might have the Heroe’s writer’s jealous they lost all their creativity long ago, with a man whose brain has been altered so that he can cause electromagnetic disturbances. The whole kerfuffle gets started after this guy accidentally causes an elevator to plummet 20 some stories, killing everyone inside except himself. But he’s not a bad guy, just a guy with some semi-stalkerish tendencies who’s having a bad day and just happens to have powers he doesn’t understand and isn’t able to control. When he gets emotional, he doesn’t write angry poetry, but makes sparks fly and pacemakers die–which is how his own mother ends up dead. It’s nice to see the people Olivia and co. are chasing aren’t always plain bad guy, like the prostitute killer and this guy, but victims of ambitious, shadowy figures. One of those steps onto the scene tonight, performing inhumane tests to advance whatever agenda he has, and is clearly the one to direct any anger toward. 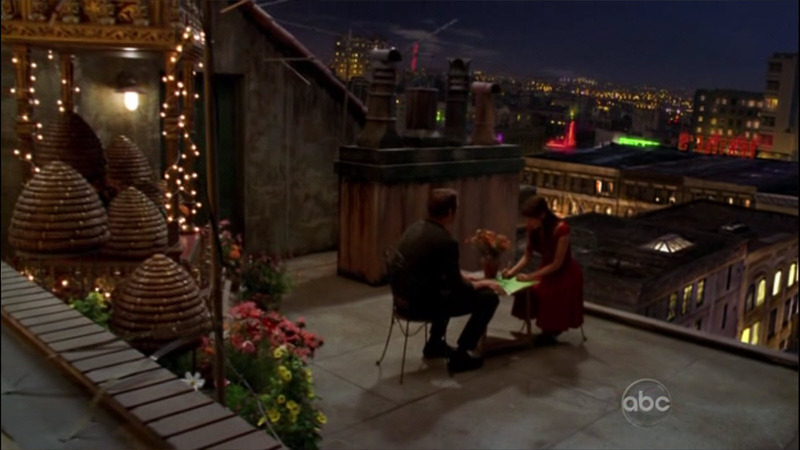 More than any other show on TV, I can count on Pushing Daisies to give me a reason to smile every week. That’s because Daisies has yet to truly let me down, even in its roughest weeks, and “Bad Habits” sticks to the very good habit of crafting an hour long escape that leaves my cheeks feeling the slightest bit tingly and my heart a little warmer. Olive and Ned are both dealing with abandonment issues this week: Olive feeling abandoned emotionally by Ned, and Ned still not over being dropped to the curb by his father. Their separate but related issues collide when one of Olive’s sisters falls from a bell tower and she brings Emmerson, Ned and Chuck in to help solve the case. So these dilemmas are nothing new, but their finally coming face with them and with each other. Olive’s run away to keep her guard up and her secrets inside it, but she gets the chance to spill it all to Ned in the nunnery and can instantly feel a heavy burden pulled off her like a plastic bag from the head. This season has demonstrated in more than one way its insistence on these characters to move forward, out of the past and into the future. The problem is that they’re scared of both their pasts, with all its dark corners, and their futures, clouded by uncertainties that point back to the past. Olive’s admissions to Ned and his subsequent apology to her, for not being the slightest bit sensitive to her feelings in his whirlwind romance with Chuck, allows her to finally move out of the past and toward that future.